I had never heard of the phrase Investigative Poetry until about two weeks ago when Sean Thomas Dougherty used it to describe my poetry. When I read those words, it was immediately obvious that he was right. He didn’t define Investigative Poetry, but I knew what he meant, and he was right. Investigative Poetry is, to me, studying and staring at one thing for a long time and writing poems about that thing. I learned this from Charles Olson and Edward Dorn. Olson once said to Dorn something like, “Ed, if you study something long enough and think about it long enough and write about it often enough, you will understand everything. Associations will be made through that one something that connects everything in the universe.” Ed Dorn responded by writing Gunslinger. An epic poem about the wild west. Dorn study the wild west and connected the universe. So that’s what I do. I first did this with an unpublishable book of poems called The Cosmology and Particle Physics of Love. That book certainly connected things in the universe. Then I wrote After Malagueña, which is really the study of one poem which leaps outward. But there are others, Negative Time (where I studied a universe that is similar to ours but where time moves in a contrary direction to ours), The Oldest Stone in the World (which was a long stare at the oldest stone in the world), Pre-Dew Poems (which is a long, never ending stare of my girlfriend), Henri, Sophie, & the Hieratic Head of Ezra Pound: Poems Blasted from the Vortex (which looked into the lives of Henri Gaudier-Brzeska, Sophie Brzeska, Ezra Pound, a statue, and Vorticism and Vorticists). 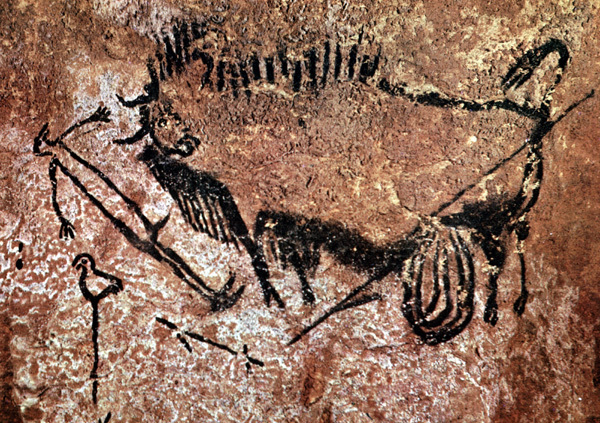 And now I’m investigating Paleolithic parietal (cave) art. Each time I do this, I gain clarity. But it’s this latter book, the book on Paleolithic parietal art, that is making Investigative Poetry make more sense to me. With this book, I stare back to understand today. I also understand our origins better. I study and imaginatively think and write. I’m making more connections with the universe than ever before. I’m discovering humanity. It happens because I’m investigating. I’m investigating humanity, and so far it’s not guilty. My description of Investigative Poetry is not all the good. A better description is in the review that just came out today on Gently Read Literature, “Khurshid Alam’s Investigative Poetry—An Interpretation on Subject, Treatment, and Technique.” This essay is wonderful. I love it. I love it because it describes very well what I am doing with my poetry. It’s got me nailed. I never thought my poetry could be nailed down, because, until recently, I’m all over the place. But this, this Investigative Poetry nails me, and I like it. Read this essay on Investigative Poetry and you will read me.